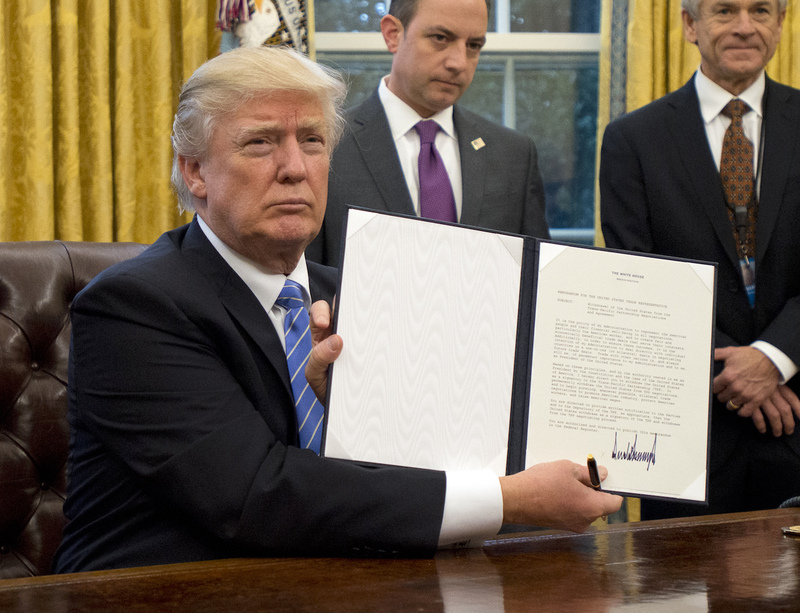 U.S. President Donald Trump shows the Executive Order withdrawing the U.S. from the Trans-Pacific Partnership (TPP) after signing it in the Oval Office of the White House, January 23, 2017. President Trump’s withdrawal from the Trans-Pacific Partnership (TPP) gives China an opportunity to take the lead with Asia-Pacific integration, but China will have to be much bolder in opening up its own economy to seize this opportunity. Withdrawing from TPP is a mistake for the U.S. TPP is an agreement among 12 like-minded countries with which the U.S. has relatively balanced trade. It would create new export opportunities for the U.S. and in particular open up new opportunities in services trade. The common narrative in the U.S. that trade has devastated manufacturing is mistaken. Manufacturing production is fine. The issue in manufacturing is that productivity growth, especially through automation, has reduced the number of jobs required for production. This is a real issue that requires a response in terms of retraining of workers, minimum income support, and other public policies that support a dynamic, expanding economy. Protectionism, on the other hand, is not going to lead to a large net increase in manufacturing jobs. It may protect certain jobs, but others in our exporting sectors will be lost. Typically, the lost jobs will be higher productivity and higher paying than the ones gained because we export the things that we are especially good at producing. While the U.S. is backing away from Asia-Pacific economic integration, China is going the other direction. It is the leading force behind the Regional Comprehensive Economic Partnership (RCEP) linking China with Southeast Asia plus Australia, India, Japan, New Zealand, and South Korea. Negotiations will probably be completed this year. The problem with RCEP is that it is not an ambitious agreement, involving only a modest amount of tariff-cutting among products that are already widely traded. China’s economy continues to be relatively closed to trade in agricultural products and especially services. China would benefit a lot from opening up these closed sectors and could use an ambitious agreement such as TPP to promote those changes. Perhaps the U.S. withdrawal will spur China to be bolder in opening up its economy. This would be a change from the last few years in which China has shown little appetite for reform and opening. It’s more likely that neither the U.S. nor China will provide the necessary leadership and Asia-Pacific economic integration will take a back seat for some years. President Trump’s Executive Order withdrawing from TPP states that “trade with other nations is, and always will be, of paramount importance to my Administration and to me, as President of the United States.” It also states that the Administration intends to negotiate future trade deals on a bilateral basis. Thus, there is reason to hope that the Trump Administration will follow up on TPP withdrawal by engaging directly with the individual parties to TPP, fixing any deficiencies in the agreement, and putting into place trade deals that reaffirm the U.S. commitment to the Asia Pacific. However, unless future bilateral agreements are essentially uniform, the United States would lose the synergistic benefits of scope and breadth, as well as linkages between and among U.S. partners and allies. Furthermore, at this juncture, the Administration has yet to spell out a positive trade agenda for the Asia Pacific. By walking away from TPP, the United States has shaken the confidence of our allies and partners in the Asia Pacific and beyond. This has created an economic and security vacuum, which will expand over time if the United States continues to turn inward. It is only natural that China will seize the opportunity to step in and assert its own agenda. For example, China is poised to intensify negotiations for the Regional Comprehensive Economic Partnership (RCEP), a China-led alternative to the TPP that includes 16 countries (seven of which are also TPP negotiating parties). Although the RCEP is under negotiation, it will likely focus on cutting tariffs on trade in goods. As a non-party, the United States will be denied the benefit of these tariff cuts. Moreover, the RCEP may green-light emerging forms of protectionism in areas such as digital trade, cybersecurity, state-owned enterprises, competition law, and so on—all of which would have been tackled by TPP. If so, this would set a bad precedent that makes it more difficult for U.S. companies and workers to compete globally—eroding U.S. economic competitiveness and dampening long-run growth. Fresh doubts about U.S. commitment to the Asia Pacific also create an opening for China to strengthen its multilateral leadership in other ways. For example, countries in the Asia Pacific may become more receptive to Chinese investment through initiatives such as One Belt One Road and the Asian Infrastructure and Investment Bank. While not necessarily harmful to the United States, these initiatives have the potential to reorient politics and diplomacy in the Asia Pacific in a manner that bolsters China’s economic and military influence. In sum, abandoning the TPP—unless it is reconstructed through a series of bilateral agreements—would make the United States weaker and less secure by renouncing our own leadership role in the Asia-Pacific region, undermining our diplomatic credibility, ceding vital markets and future growth to our competitors, and creating a dangerous economic and security vacuum in Asia. The Executive Order issued on Monday was not surprising, yet nevertheless hit hard. Our T.P.P. partners are scratching their heads trying to figure out how the United States, after achieving so many of its priorities in the negotiations, is withdrawing from the agreement. They are discussing internally and among themselves how to respond to this post-T.P.P. world. The U.S. exit from T.P.P. presents an enormous opportunity for China. One only has to read President Xi’s Peru A.P.E.C. remarks and his speech at Davos to conclude that China is ready and willing to step into the vacuum that the United States has created. The question will be how this translates into actual leadership at the trade negotiating table. It’s easy to talk about anti-protectionism, free trade, and inclusive globalization. It’s another thing entirely to translate these principles into actual negotiating positions. Leadership on trade means leading by example and opening and reforming one’s market, and then translating these openings and reforms into binding commitments. This will be the challenge for China. In many respects, we have given the “keys to the castle” (a term used by Amb. Froman) to China. The question will be whether China has the strength to open the door by leading Asia by example with market opening and reform. South Korea was not a party to the T.P.P. The U.S. already has a bilateral trade agreement with Seoul. Trump has criticized the U.S.-Korea bilateral trade agreement negotiated by the Obama administration for one-sidedly facilitating only more Korean exports to the U.S.A. (although the U.S. sales of services to Korea has risen). Trump’s criticism is 100% accurate. Can Trump get the South Koreans to re-negotiate? If that fails, does he just end the agreement or add tariffs? Both are legal. Both would have enormous impacts in Korea, making political power for an anti-American left far more likely. Good diplomacy requires thinking ahead about issues in all their complex ramifications. Trade issues do not exist in a political vacuum. Shouldn’t we expect the Korea issue to become far more prominent than it now is if there is to be any credibility to a Trump policy of bilateral trade agreements that are good for increasing manufacturing jobs in the U.S.A.? Is there any reality to this policy of trying to increase manufacturing jobs in the U.S.A. as manufacturing increasingly robotizes? Is what is happening now to manufacturing jobs in the U.S.A. not similar to what happened in earlier generations to the reduction of farming jobs? Would it make sense to have a trade policy aimed at increasing the number of farmers in America? How does one roll back the changes wrought by globalization (cheap, mobile finance and rapid, low-cost shipping) which advantage lower cost labor in poorer countries? How does one address the negative impacts of globalization for the global north? These negatives are real and serious. Globalization in fact advantages the global south. Globalization has facilitated the recent, awesome rise of the global south (China, India, Indonesia, etc.) to the point where the global south now accounts for 50% of the world's G.D.P.. Would it be a moral good to try to reverse this tendency? The TPP is dead, at least for the time being. But instead of dissecting President Trump’s problematic trade policies, many are quick to point out that it will provide a great opportunity for China, especially in pushing forward R.C.E.P., in which the U.S. is not participating. Such language and thinking is not only toxic but ridiculous. Who on earth should exclude China, the world’s largest trading nation and home to a fifth of humanity, from participating in making global trade rules, or any global rules? Such a mindset is simply anti-democratic. The problem with the T.P.P. is that it has been promoted more as a geopolitical wrestling with China than a free trade deal. Does that mean that even Obama was not sure about the T.P.P.’s economic benefits to the U.S, so he had to sell it by fearmongering about China? In fact, some U.S. economists have pointed out that the economic benefits to the U.S. are quite limited or even negligible. If that is true, then American workers have every reason to oppose the T.P.P. based more on geopolitical concerns than on their own wellbeing. Despite the fact that the T.P.P. was touted as the F.T.A. of the 21st century, there is no doubt that the R.C.E.P. is a step forward, towards more regional economic integration and that it will inject vitality to the most economically dynamic region in the world. In this regard, it should be applauded. The most important thing is that the R.C.E.P. has never been sold as a geopolitical game against the U.S. It can’t be because many R.C.E.P. partners are U.S. security allies. However, the sheer fact that the R.C.E.P. is a free trade agreement rather than a geopolitical game shows its superiority to the T.P.P. Let’s also be clear. China won’t and cannot dictate the R.C.E.P. The 10-nation ASEAN, Japan, and India are some of the heavyweights in the group. “Adopting international norms” has been the catchphrase since Deng Xiaoping launched the reform and opening-up drive in 1978. China has learned a lot in the past decades by learning from international norms. It is also true that compared with many advanced countries, China still has a lot to learn and catch up on in that process. The U.S., Europe, and other advanced economies should be more patient. Even within the U.S, the 50 states are vastly different. For example, should California—the state with the strictest environmental law—demand that Texas or Ohio change their local environmental rules before trading with them? Or should New York and Massachusetts exclude Mississippi and Alabama from the table because their social agendas are not progressive? China and the U.S. should find common ground and pursue win-win cooperation rather than indulging in zero-sum thinking. After President Trump pulled the U.S. out of the T.P.P., many speculated that China would become the new leader of globalization, and that globalization would begin to follow rules written by China, not by the U.S. But can China really take the place of the U.S. in leading globalization? It is a part of a larger question: “Can we have globalization without U.S. leadership?” The answers to both questions are no, at least not for now. Since the 1980s, American consumerism has driven the expansion of global free trade. Without this consumerism, and without U.S. maintenance of its market openness to the world, globalization will be hard to move forward. For decades, the U.S. has been running the largest trade deficit with the world, while other major economies mostly have been running surpluses with the world. Since the 1980s, the U.S. has been “the consumer of last resort” for the global economy, sucking in consumer goods manufactured by export-oriented economies such as China’s, which, in turn, have been sucking in raw materials, machines, and manufactured components from the global supply chain. Without U.S. consumers, there can hardly be much globalization. This special role of the U.S. consumer market in the global economy is not accidental. Recent historical studies find that American political economy is unique compared with other advanced capitalist economies. The U.S. tax system promotes consumption and represses savings. In contrast, tax systems in France, Germany, and Japan promote savings and exports and repress consumption. This contrast dates back to the late nineteenth century. While American capitalism has been uniquely biased toward consumption, the role of the U.S. dollar as the global reserve currency since 1945 necessitates that the U.S. run a large current account deficit with the world. To maintain the dollar’s grip on the world economy, as its dominant reserve currency and the currency of choice for international transactions, the U.S. has to provide the world with sufficient liquidity through a massive outflow of its money. As such, a large trade deficit is tolerable if not desirable to the U.S., and has enabled the U.S. to lead globalization over the last few decades. If China wants to lead the globalization process, then it will need to find the new consumers to replace the U.S. consumers. Yes, consumption has been rising in China. But the increase in production capacity there always outpaces the increase in consumption, resulting in overproduction. As commentators above rightly point out, the Chinese government has been hesitant in opening up its own market. To push for globalization without the U.S., China will have to undertake fundamental economic restructuring to lift its economy’s consumption share and increase its market openness. This cannot be done easily and swiftly. It is why China is still far from capable of assuming leadership in globalization in lieu of the leadership of the U.S. The United States’ withdrawal from the T.P.P. leaves China as the single power in a position to remake trade rules in the Asia Pacific, whether through the R.C.E.P. or bilateral trade agreements. But the future architecture of such agreements would take a different shape under China’s leadership, at least judging from China’s current approach to international trade law. More than any other existing multilateral trade agreement—including the W.T.O.—the T.P.P. could trigger a linkage between trade and human rights. The T.P.P. contains non-trade obligations that emanate from international human rights law and reinforce fundamental values including fair labor standards, intellectual property protection, environmental protection, and Internet freedom. These provisions are at odds with many of China’s domestic legal policies and practices. Internet censorship is a case in point. For the first time in 2016, the Office of the United States Trade Representative listed China’s Great Firewall, which bans Internet companies like Google, Facebook, Twitter and YouTube from operating in China, as a trade barrier. And the American Enterprise Institute’s Claude Barfield has suggested taking China to the W.T.O. over this matter. Under recent international trade law, the W.T.O. has not always supported China’s practice of citing an exception clause in W.T.O. law that allows a member state to erect trade barriers on the grounds of protecting public interests. In 2009, China lost a WTO dispute with the U.S. over its copyright law, which grants copyright protection for imported movies, music, and books only if these works had passed government censorship. The W.T.O. found that these provisions constituted a trade barrier. In its own trade negotiations, China has been successful at separating human rights issues from free trade provisions. Therefore, if China now takes the lead in building new regional trade regimes, it will try its best to exclude any non-trade values from those agreements. The T.P.P. was meant to be more than a trade agreement—it sought to build a union of shared values. Contentious as some of its provisions, it brought a number of human rights standards to the table of trade negotiations: social welfare, economic and political freedom. And the underlying precondition for countries adopting these standards is the rule of law. This is why China is unlikely to follow the Australian government’s invitation to fill the vacancy in T.P.P. after the U.S. pulled out. There is no reason why the Chinese Communist Party would want to be trapped by such a future trade regime based on the T.P.P. Asia’s regional trade architecture under China’s lead will most certainly be a very different animal. The biggest loser from the United States’ renunciation of T.P.P. is certainly the United States itself. But ironically, China is a close second. The U.S. lost its best opportunity to expand market access in high value-added sectors, to extend global governance into new areas screaming for clearer rules (e-commerce, investment, the environment, state-owned enterprises, to name a few), and to gain greater credibility around its commitment to the Asia-Pacific. The notion that a series of bilateral agreements can make up for the T.P.P.’s collapse is wishful thinking. Advocates of a series of bilateral deals argue they will be negotiated more quickly than multilaterals and not require as many concessions. Well, what is faster than ‘already done’? Nothing. The T.P.P. was already locked in and months away from implementation. We are now back to Square One. And no series of bilateral deals can replace the benefits of the T.P.P.’s common—and high—standards in an era of transnational supply chains and global markets. The T.P.P.’s relative advantages would have only grown as it acquired new members. They were already lining up out the door. That all said, China will suffer as well. Not because it now cannot benefit from taking advantage of the T.P.P.’s supposedly loose rules of origin to sneak its exports in the back door. (That charge was always a canard.) But rather, because the T.P.P. was the only serious external source of pressure pushing China to engage in genuine economic liberalization, which is the key to it escaping the middle-income trap. Under Xi Jinping the state has become much more interventionist, productivity gains have come to a halt, and the only source of recent growth has been credit expansion and stimulus. The T.P.P. had the opportunity to serve as a catalyst pushing China to liberalize its markets, reform state-owned enterprises, and move toward a knowledge-based economy. In fact, the future shadow of the T.P.P. already started to affect Chinese economic policies, with the creation of new foreign trade zones, progress in negotiations toward a bilateral investment treaty with the U.S., and the development of a national negative list for investment. It is conceivable that Xi Jinping will summon the political will on his own to carry forward with greater liberalization, but the chances of China staying wedded to stimulus and government intervention have only grown with the T.P.P.’s burial. External pressure will still be coming from the U.S., most likely in the form of more trade remedy cases, higher tariffs and blocking Chinese investments in America, but rather than incentivize China to liberalize, China more likely will be impelled to move in two other directions. First, it will retaliate against American imports and investors in ways transparent and opaque. And second, China will enhance its efforts to complete a series of trade and investment agreements with its neighbors and with Europe and push forward with its One Belt, One Road infrastructure investment initiative. But unlike the T.P.P., these agreements will be shallow and oriented around limited tariff reductions, and the One Belt, One Road may simply be reduced to a convenient outlet for sectors with massive overcapacity. The death of the T.P.P. gives China’s old growth model a new lifeline by not compelling the country to liberalize in a more thorough-going manner as is truly needed. The flurry of deals may make it appear as if China has taken advantage of the U.S.’ achievement of stealing defeat from the jaws of victory. But unless China surprises the global community with a new wave of domestically-driven liberal reforms, China will only ascend to the top of a lower, diminished mountain top.